FAIRFIELD — “Some things in life are worth waiting for,” according to the listing agent of a property in the northern Fairfield Greenfield Hill neighborhood. The sentiment is true, and yet prospective homebuyers should wait no more. 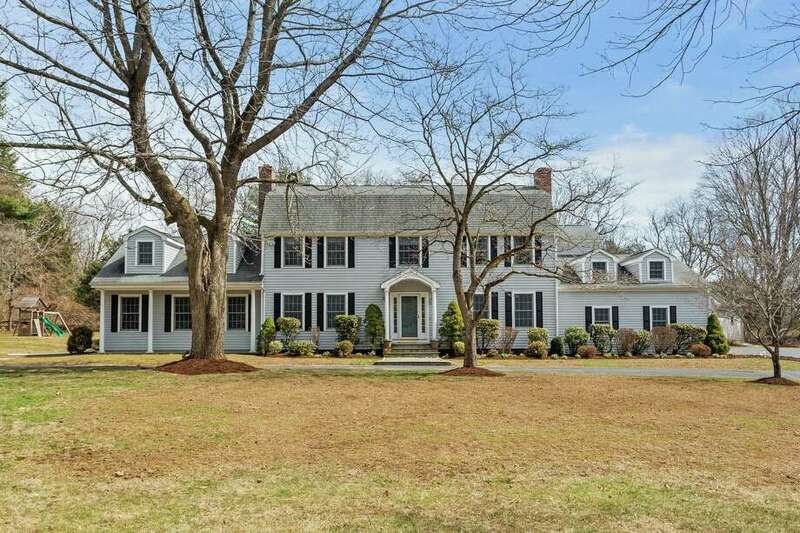 The time is right to consider moving into the gray colonial house at 200 Eleven O’Clock Road, especially with summer right around the corner. This is a house for all times and seasons, although the size of the property, square footage of the house, the heated in-ground swimming pool and sizable pool house make it particularly ideal for warm weather living and entertaining. This 11-room house was built in 1965 on a level property of just over two acres and it was beautifully updated to create a relaxed, designer-chic feel throughout its 4,203 square feet of living space. During the updating, the rooms received contemporary touches including shiplap on one wall of the breakfast room, bead board in the bathrooms, decorative paneling, and grass cloth wall covering. The interior paint colors depict trending neutral earth tones while some rooms still reflect the ever-popular shades of gray. Together, all of these features offer a level of refinement while also providing a whimsical touch. The house also features surround sound in the family room, office of playroom, outdoor patios, and master bedroom suite. The “move-in condition” house balances perfectly between colonial and contemporary as well as between elegant and casual. From the exterior, it has the silhouette and appearance of a colonial. Inside, it has the open, easy-flowing floor plan of a more contemporary construction. It is located in “one of the loveliest neighborhoods in Fairfield, where dog walkers and kids on bikes are the everyday norm,” the agent said. It is a family-friendly neighborhood that offers the bucolic beauty of the Fairfield countryside yet it is only about 10 minutes from downtown Fairfield shops, restaurants, and the train station. Within walking distance is the Connecticut Audubon Society on Burr Street and the 155-acre Roy and Margot Larsen Wildlife Sanctuary. “The sanctuary has 7 miles of trails that include the Chiboucas wheelchair-accessible trail for the disabled. Observation platforms and bridges, interpretive signage concerning the history of the area and its flora and fauna, and an Algonquin wigwam replica all add to the experience. A brochure with a self-guided hike is available at the center,” the Audubon Society website says, adding that hundreds of species of birds can be found within the sanctuary. Inside, the formal living room has the first of the home’s three fireplaces. The second is in the formal dining room and in the family room there is a stone fireplace. In the gourmet kitchen features include a center island/breakfast bar, granite counters, built-in desk area, skylight, and sliding doors to the backyard and a flagstone patio. High-end appliances include a Sub-Zero refrigerator, Viking gas range top, and two Bosch dishwashers. The sizable breakfast room has two pass-through areas to granite counters in the family room, ideal for entertaining. The generously sized family room has a vaulted ceiling, a bar area with Viking wine fridge, and two sets of doors — both topped with a fanlight transom, to the backyard and a second patio. A third patio is found by the 768-square-foot pool house, which features an entrance ramp, living and dining areas, kitchenette and a full bath. Off the family room there is a flexible use room that could be an office or playroom. On the other side of the kitchen there is a good-sized mudroom with built-in cubbies and storage, a laundry room with a utility sink, half bath, and door to the backyard. Upstairs, there are five bedrooms. The master suite has a walk-in closet, two additional closets with mirrored French doors, and an updated marble bath with double Fairmont vanities, marble floor, Bain Ultra oversized soaking tub and a substantial shower with jets and rain showerhead. There is ample space in the full partially finished basement. For more information or to set up an appointment to see the house contact Pam Foarde of Al Filippone Associates/William Raveis Real Estate at 203-257-9110 or pamf@afahomes.com.